Port awards project to P.R. Worth, Inc. to enhance Marine Drive pathways, create rain gardens, tree scapes, marina parking improvements. 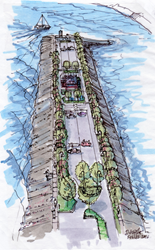 Kalama project will enhance pathways, landscaping and beautify the Port’s riverfront marina parkway. 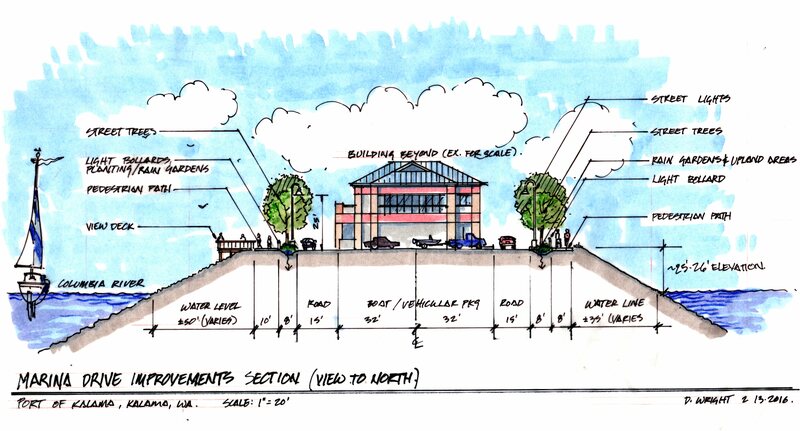 The Port of Kalama board of commissioners has awarded the Marine Drive Trail Improvement Project to P. R. Worth, Inc., a Kelso-based civil site work development contractor serving the Pacific Northwest with excavation, site work, underground utilities and development expertise. The $1,062,815.91 contract will enhance pathways, landscaping and beautify the Port’s riverfront marina parkway. The project is expected to run from the week of March 14 through mid-summer. P. R. Worth utilizes best practices and equipment to ensure their projects are environmentally sound. “We are very conscientious that this project is adjacent to the Columbia River and Port marina area so as a proactive measure we are using 100% water soluble biodegradable hydraulic fluid in our equipment – completely carbon and oil free to fully protect the environment and waterways,” says Preston Worth, president, P. R. Worth, Inc.
Worth adds that in an effort to reduce any carbon footprint associated with the project he commits to buying all products within 100 miles of the Port of Kalama. All subcontractors on the project have been hired locally as well. The marina boardwalk and the pathways to the south of the Port administration building into the park will be open to visitors during construction. Some pathways will be obstructed at the north end of Marine Drive while landscaping and improvements take place though detours will be well-marked. Visitors will still have access to Marine and Rasmussen parks and parking facilities. During construction, drivers will be advised of temporary routes and parking via signage on the premises. The contract also has provisions that allow construction to be suspended during the peak spring fishing season when the boat launch and parking are heavily used. Cowlitz County awarded the Port of Kalama a $30,000 grant for the Port of Kalama Trail Improvement Project. The grant enables the Port to improve pedestrian and vehicle separation along West Marine Drive. The improvements are part of the Port’s mission to enhance recreational opportunities and are expected to be completed by mid-summer. The Port of Kalama is located in Southwest Washington on the Columbia River and immediately off of Interstate Highway 5. The port exists to induce capital investment in an environmentally responsible manner to create jobs and to enhance public recreational opportunities. Port of Kalama's industrial area includes five miles of riverfront property adjacent to the 43' federally-maintained deep draft navigation channel of the Columbia River. The Port is served by the Burlington Northern/Santa Fe and Union Pacific railroads. There are over 30 businesses located at the Port of Kalama, employing over 850 people. Port of Kalama offers all the superior facilities businesses need to thrive, and an unsurpassed quality of life. The port offers shovel ready sites, a new Industrial Park, state of the art Marine Terminals and transportation accessibility to rail and highway all just a 30 minute drive to the Portland International Airport. Port of Kalama also offers high-bandwidth communications, with dual access fiber-optic service to Seattle and Portland. Properties currently available at the port for businesses wishing to expand and thrive: Visit http://portofkalama.com/available-properties/. or Claudia Johnson, public relations, 503-799-2220. Port of Kalama enhances pathways, landscaping and beautify the Port’s riverfront marina parkwayPathway improvements commence on Port of Kalama riverfront. Port of Kalama to offer commercial land for developmentPort of Kalama offers commercial land off of I-5 at exit 32 in Kalama, Washington. 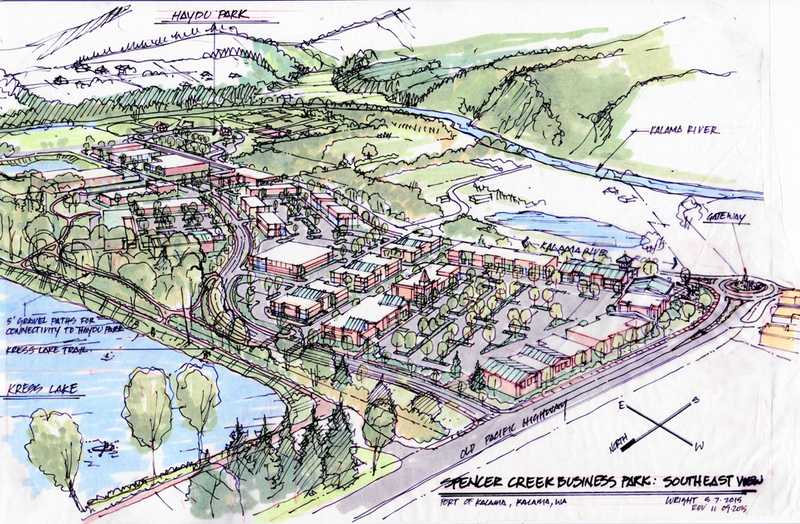 70 acres of prime commercial land ready for development in KalamaPort of Kalama is ready to develop 70 acres right off of I-5 at exit 32 to make way for the much-anticipated Spencer Creek Business Park.